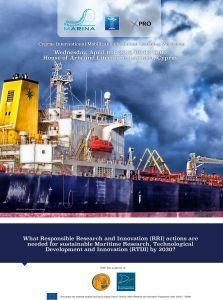 What Responsible Research and Innovation (RRI) actions are needed for sustainable Maritime Research, Technological Development and Innovation (RTDI) by 2030? Did you know that Cyprus is the 11th largest merchant fleet globally and the 3rd largest fleet in the European Union? In fact, under the Cyprus flag, there are more than 1800 ocean-going vessels with 21 million tons of gross volume. The marine industry in Cyprus contributes €1 billion per year to the local economy accounting for over 7% of GDP (including auxiliary services) and directly employing 4,000 shore-based personnel and 55,000 seafarers from around the world. How can we maintain and strengthen our leading position in the maritime sector, while efficiently coping with unavoidable challenges, such as the digitalisation of the industry, constantly upgraded regulations on marine transportation, environmental restrictions, climate change, the ever-growing size of the vessels at the sea, the responsible recycling of older ships, even piracy and cyber attacks? This international workshop aims at discussing the challenges that the maritime industry is facing and defining actions that will enable the industry to become resilient, responsible and sustainable. You want to use your creative mind to develop solutions that best serve individual citizens, your local community and the European society at large? You want to make sure that your needs and expectations are taken into account when local, national and European decisions and innovations are being developed? The workshop is organized by the Cyprus Neuroscience & Technology Institute (CNTI) and XPRO Consulting with the support of the Maritime Institute of Eastern Mediterranean (Mar.In.E.M.) and the Larnaka Municipality and it will be implemented using the methodology of Structured Democratic Dialogue. It will involve citizens, scientists, business representatives, entrepreneurs, local authorities and policymakers in an open dialogue. Together, you will define a common vision and a roadmap of solutions and actions to face this challenge. The results, together with the outcomes of the other MARINA workshops in Europe, will be freely accessible on the MARINA Web Knowledge Sharing Platform, used for identifying lessons learned and best practices and disseminated at European policy conferences.